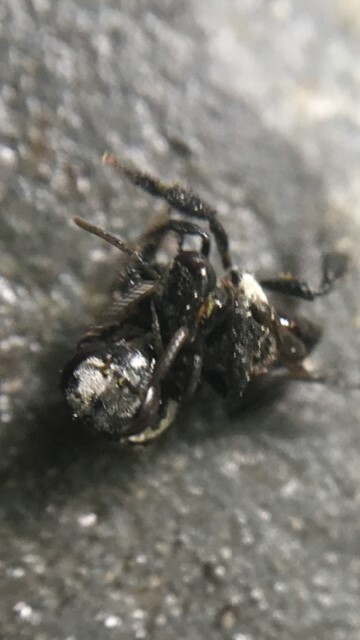 I find that some of my customers get worried about their new native stingless bees, and thinking back, I too used to worry and watch and wonder what I should be looking out for. 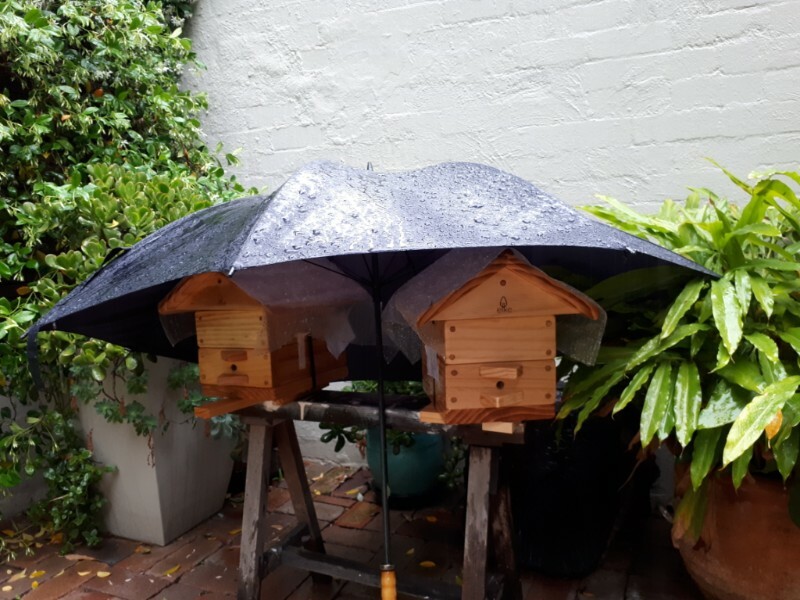 Here are a few things you can observe, learn and tips I’ve learnt over the years of keeping both native stingless bees and honey bees that might help you, your bees, or just give some piece of mind. Out of the ordinary behaviour can happen on (or just before) summer heatwaves or summer storm weather. One particular is this hive where many bees were crawling over the hive (looking to get in). We worked out that the entrance hole had been blocked (possibly melted over). So the observant and caring beekeeper was able to open up the entrance hole with a skewer (or a stick) and the bees were relieved to once again fly in and out. It is worth checking this in your hive. 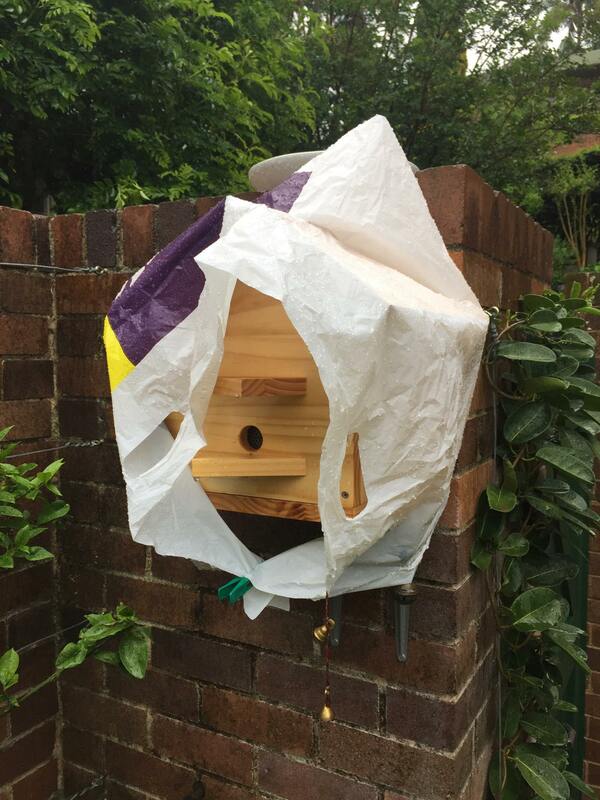 Note: sometimes (actually quite often) the bees may make a resin ‘curtain’ /’awning’ like the one seen below. This is natural and done for both climate control and defense. As long as there are bees coming and going, then it is best to leave it all in place. Another phenomena I have noticed in Sydney is the higher than previous years presence of the Bembix wasp. 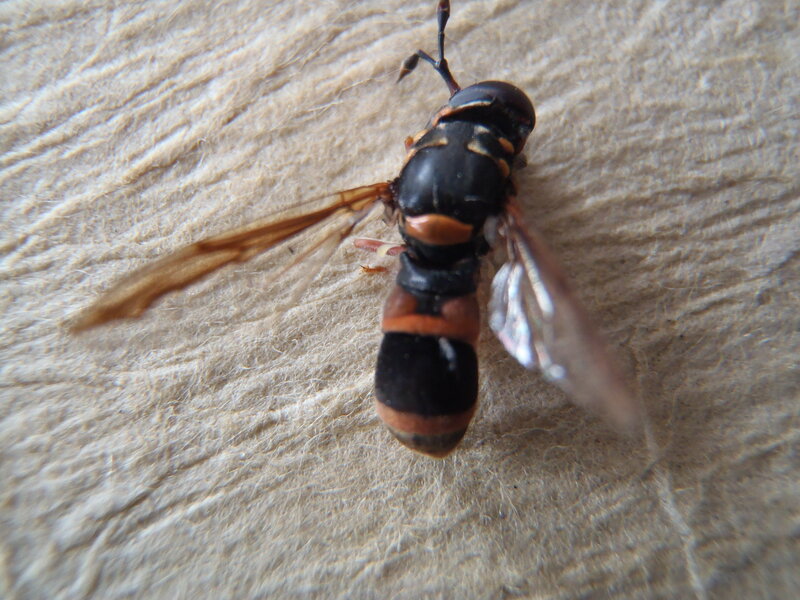 This wasp will hover around the front of the hive and capture bees and feed them to their larvae. Apparently the wasp needs 30-50 bees to feed one larvae. There seems to be a certain time in summer that this is more prevalent It is worth reducing these wasps and one way that I am able to do this is with a battery powered (tennis racket shaped) fly swatter/zapper to reduce the wasp numbers and give the bees a better chance. We also need to recognise there is a complex biodiverse food chain relationship and wasps do have a role in our environment too, so the odd wasp is ok in my mind. 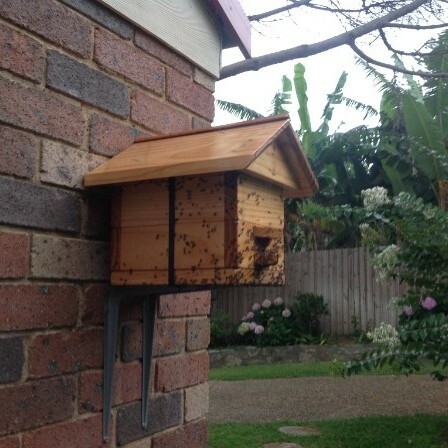 In a strong native bee hive this shouldn’t be too detrimental, however it is worth keeping an eye out for them. There is another predator to look out for – the syrphid fly. This fly can cause major problems for a hive. It will lay very small eggs in cracks on the outside of a hive, the larvae will then pupate and crawl inside a hive and finish off its development inside the hive and if too many of them are present, they can destroy the insides of the hive. 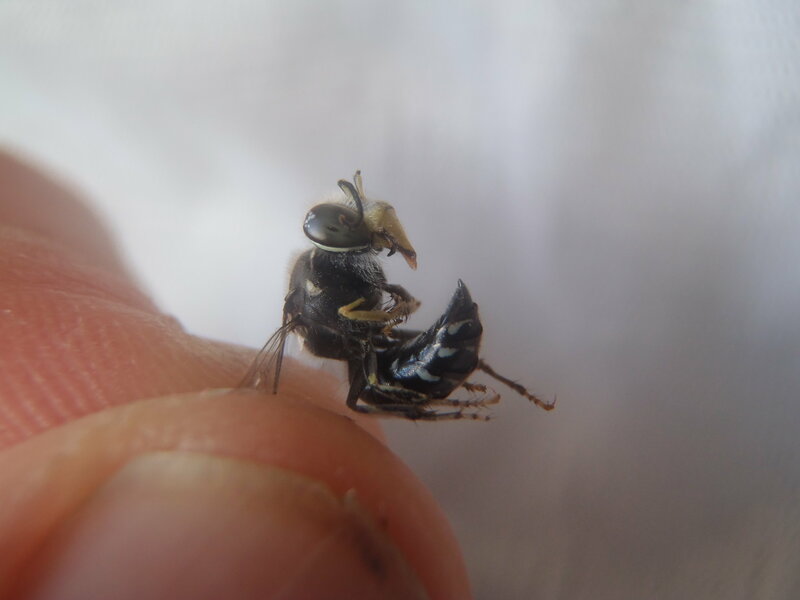 These syrphid flies are definitely worth spending the time to destroy if you notice them near your hive. see pages 35 and 36. I hope I haven’t worried you all too much, but I thought it was timely, given the few emails and calls I have had about the above. 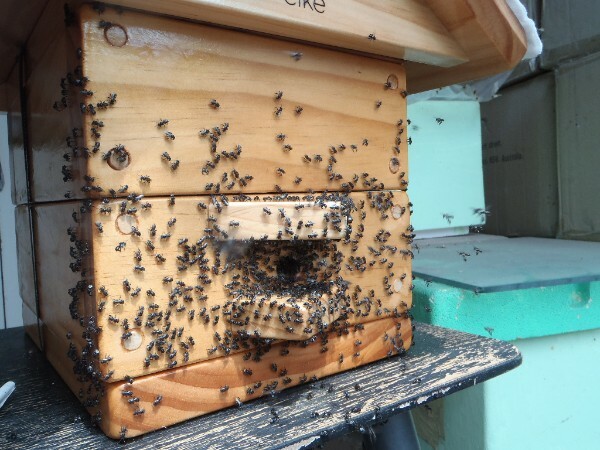 in a normal hive, you should notice a steady stream of bees going in and out of your hive (this is a good sign). As well, you’ll notice sometimes bees bring out ‘garbage’ balls. This is the lining of the eggs. This is also a good sign as it means new bees are being born. If you notice a cloud of bees in the air (just hanging in a cloud) then you’ve got a congregation of males (drones) that are likely on the lookout for a virgin queen. Your hive will naturally and periodically re-queen itself if the colony decides it needs to. This is a natural occurrence (and nothing to worry bout). The other type of swarm (in the native bee world) is called fighting swarm, where a colony from elsewhere is fighting with your bees. This is when bees (from 2 different colonies) wrestle each other. The stronger colony wins and will insert a queen (and hence their stronger fighting genetics) into the hive. Whilst this looks very destructive and detrimental to the colony, it almost always ends up in a stronger hive. It is unknown why these social insects fight with each other like this. in Sydney, we seem to be reciging more extreme rain events (heavy downpours). Add an awning or an umbrella to add a bit more protection form the rain. I hope that your gardens get a good drink and you and your bees keep safe. 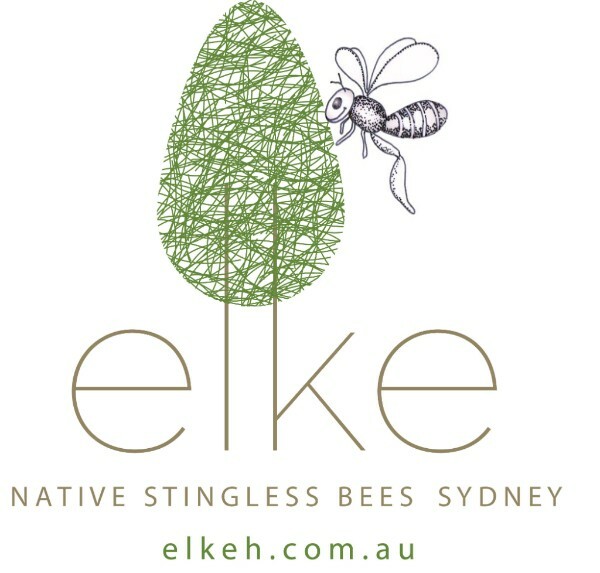 Photo: elke Native Stingless bee hives in rain – with umbrella. Plastic bag ‘raincoat’ for rain protection. 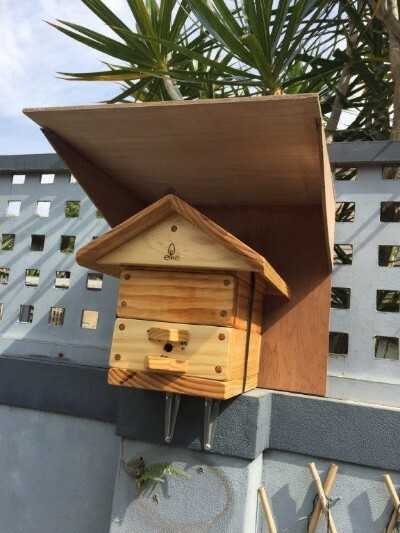 For the visually minded people (like me), here are a few photos showing various examples of how native stingless bee hives can be installed. Fixed on metal brackets 250mm x 250mm to underside of hive. It is ok to screw up into the base plate of theive (as long as the screws are not longer than the base plate (a 20mm screw is fine). This hive is east facing and is ‘undercover’ yet receives 3 hours of direct morning winter sun. This hive is on an east facing wall – the courtgarden faces north. You can see the morning sun streaming into the hive – located about head height to get that sun and air flow in this sheltered courtgarden. In a larger garden, a timber post fixed with smaller brackets works well. 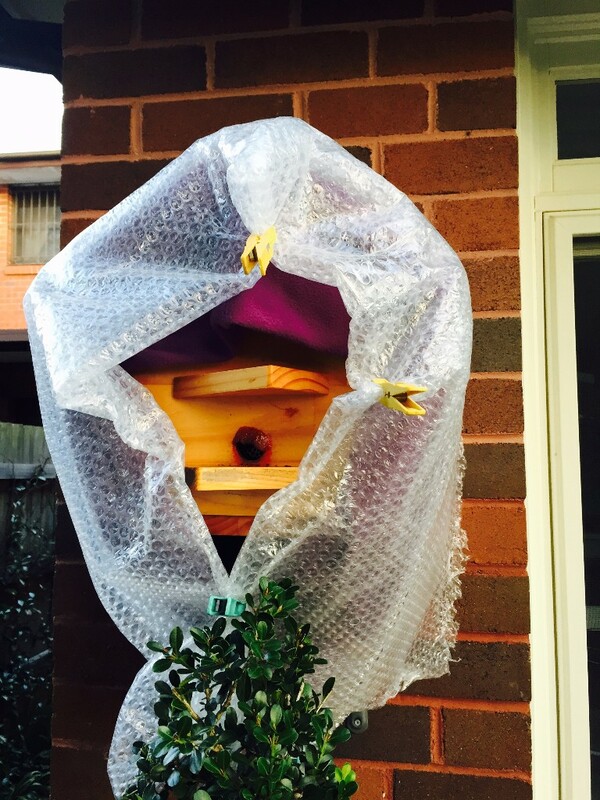 This nestled hive is attached to a screen fence. The deciduous, flowering climber is cut back in winter to allow extra light, sun and air flow to the hive. The summer foliage helps cool and shade the hive.